This summer, teaching incoming freshmen at UAlbany, I found my classes populated by a number of students whose families hailed from the Dominican Republic, Puerto Rico, and other Caribbean countries. In the downtime before class, talk frequently turned to food. These students were living away from the comforts of home, subsisting on a diet of dining hall cuisine. And so they reminisced: about their mothers' cooking, about the little place on the corner back in Queens or Spanish Harlem that made the best food. Some students discovered the chicken at Mr. Pio Pio on their own, but they wanted more recommendations. 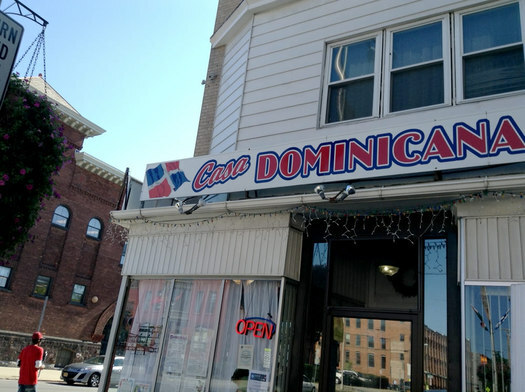 Unfortunately, it wasn't until after the summer term ended that I got to check out Casa Dominicana on Central Avenue for one of the dishes my students raved about: mofongo. And it's not just any mofongo. At Casa Dominicana, while there are several types on the menu, including shrimp and stewed catfish, it was the Mofongo de Chicharron -- mashed plantains with chunks of pork shoulder with crisped skin -- that made me want to proclaim this as a truly deserving Eat This! dish, not just for my former students, but for all Capital Region eaters. Casa Dominicana is bright and welcoming. The walls are painted to include a map of the Dominican Republic, a lovely mural of Sosua Beach, and portraits of Latin American players for the Yankees and Mets. But more than that, there is owner Hector Marmol and the enticing aromas of cooking meat and warm spices. Marmol greets customers at the counter, and it is clear that many who visit are regulars. ("You're here early today," he said to one during my last visit.) He's been in the restaurant business for more than three decades, starting with an outpost in Brooklyn and then two in Queens. Seven years ago, he moved to Albany and opened up Casa Dominicana. "I moved out of the city because it's very expensive there," Marmol says. "It's much easier to own a restaurant here." 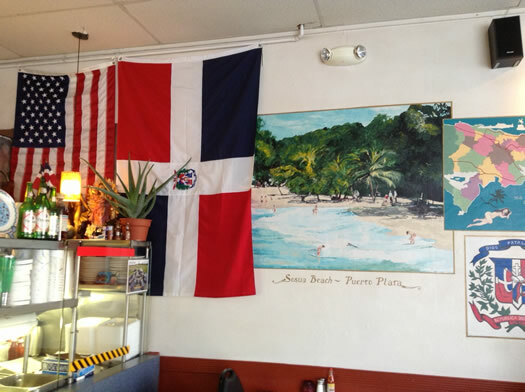 At Casa Dominicana he features the flavors of not just the Dominican Republic, but also nearby Caribbean countries such as Puerto Rico and Cuba. "Mofongo is more Puerto Rican," Marmol says, though it's closely related to the Dominican mangu and the Cuban fufu de platano. All these dishes are descendants of the African peanut soup dish known as fufu, and they have one main element in common: the plantain. Whereas I'd previously enjoyed fried plantains as a side dish, more work is done with the fruit in the case of mofongo. The process, as described by Marmol: "We use the green plantain, which is sweeter. We slice the plantain, fry it, then mash it." To give this mashed plantain mixture its flavor, Marmol uses a generous amount of fresh garlic, which is first cooked and then mixed in with the plantains. The sweetness of the plantains and the flavor of garlic are abundantly present in the Mofongo de Chicharron at Casa Dominicana. But the pork steals the show in this dish, as it's presented in a variety of forms. Most noticeably, there's a thick, crispy piece of pork rind sitting right atop the mountain of mofongo. This is the chicharron from the dish's title. As delicious as that piece is, the dish also highlights the chunks of roasted pork that surround the mofongo. "We marinate the pork three days before we cook it," says Marmol. "We use garlic, oregano, and sazon [a traditional spice blend] to give it the good flavor." These pieces of pork are tender and full of flavor, impressive because, as Marmol noted, pork can easily become dry during the cooking process. Marmol is aware, too, that a cook walks a fine line with mofongo -- it's also easy for the mashed plantains to end up dry. The small pieces of pork that are mixed into the plantains add to the flavor and texture, but they don't make it any easier to avoid the mixture becoming pasty. 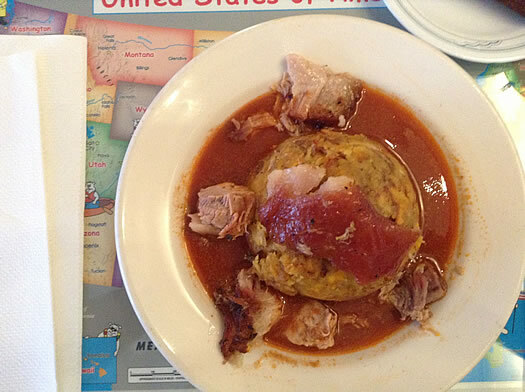 To combat this, Marmol serves a tomato-based sauce in the bowl surrounding the mofongo. This tomato sauce works in perfect harmony with the mashed plantains, much in the way that gravy complements mashed potatoes. All the elements of mofongo my students told me had to be present -- the strong garlic taste, the plantain sweetness, the crispiness of the pork, and the moistness of the mixture -- are all on display in Casa Dominicana's verion, all of which make this a highly satisfying dish. Jeff Janssens writes about food and beer at The Masticating Monkey. Thanks so much for writing about this gem of a restaurant. I love it there and love seeing them get the attention they deserve! I love this place! I used to stop in often after visiting the salon next door. They are very friendly and the food is great! One minor quibble - green plantains are not sweet, they're very starchy though. To get sweet, they need to be yellow with brown spots, or even pretty much black.